Randy Hundley knows exactly how Willson Contreras feels on the field. Both Hundley, one of the most popular Cubs catchers in history, and up-and-coming catcher Contreras were both energy guys. They’d like to be in the center of things. In Hundley’s case, probably too much so. He tried to offer the 1969-vintage Cubs too much of a good thing by catching in 151 games, a year after he set the big-league ironman record behind the plate with 160 games. Hundley catching doubleheaders was like Jack Brickhouse yelling “Hey Hey!” It was second nature in summer. Over the Labor Day weekend — Friday through Monday — in 1967, the Cubs played a barbaric four consecutive doubleheaders. Ernie Banks got his “let’s play two” wish by starting all eight games at 36. Hundley caught seven of the eight games while appearing in the eighth contest via a double switch. Now he is older and wiser as a veteran of multiple knee injuries that probably had a connection with his self-imposed overwork. Hundley, handsome and youthful-looking as a 75-year-old great grandfather, firmly advocates Contreras — whose offensive potential is too valuable for the Cubs to squander — take regular breaks from catching, either on the bench or in left field. Randy Hundley (center) is always a fountain of knowledge about catching. 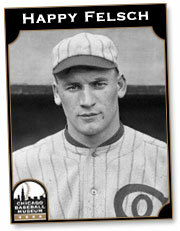 He did it again in a recent reunion of 1969 Cubs personalities. 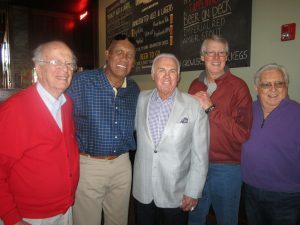 From left, WGN sports editor Jack Rosenberg, Hall of Famer Fergie Jenkins, lefty pitcher Rich Nye and Cubs media relations director Chuck Shriver. “I see him as being a 25-homer guy, maybe 30, if he can stay healthy,” said Hundley, who no doubt will cross paths with Contreras at the Cubs Convention and spring training. “But I can tell you right now, it’s going to be difficult as long as he stays behind the plate. They could play him in the outfield (against some lefties). I’d say anytime he can play in the outfield, I would certainly do it. Contreras burst on the scene in mid-season 2016 to seize the catcher’s job and clutch hitter’s mantle. He had 21 homers and 74 RBIs in 2017, but would have had even more robust run-production numbers if not for a late-season leg injury. Contreras will still want to develop into a defensively competent catcher in the time he does spend behind the plate. “The first thing I’d say is throwing,” Hundley said. “The second thing is to catch every pitch. Don’t let anything get by you. Block the ball any way you possibly can. “It takes a lot of work to do that. I had one year where I think I had four or five passed balls, four or five errors, catching every day. That’s something I’m very proud of. You really have to work at it. It really has to be on your mind all the time. You can’t slough off. One outstanding Contreras attribute is picking off runners at first base with a lightning-quick release. Willson Contreras’ learning curve will include leadership of the pitching staff. Hundley was proclaimed as the Cubs’ team leader in his era despite Ron Santo’s status as team captain. He had a firm handle on his pitchers. Any serious variance from the game plan or knuckleheaded action by the pitcher often drew a Hundley return throw that was faster than the pitch in question. Thus Contreras’ leadership will need further development along with his physical skills. “You have to constantly work at it,” Hundley said. “Any time you have any doubt in your mind, you’ve got to go to that mound, talk, to the pitcher and make sure you’re on the same page. If you don’t, it can mess up a game real quickly. Hundley admitted he had baseball on the brain almost every waking moment in his prime. Contreras need not extend his work hours to his home life. But focusing up to the Hundley level while on duty will serve him just fine.